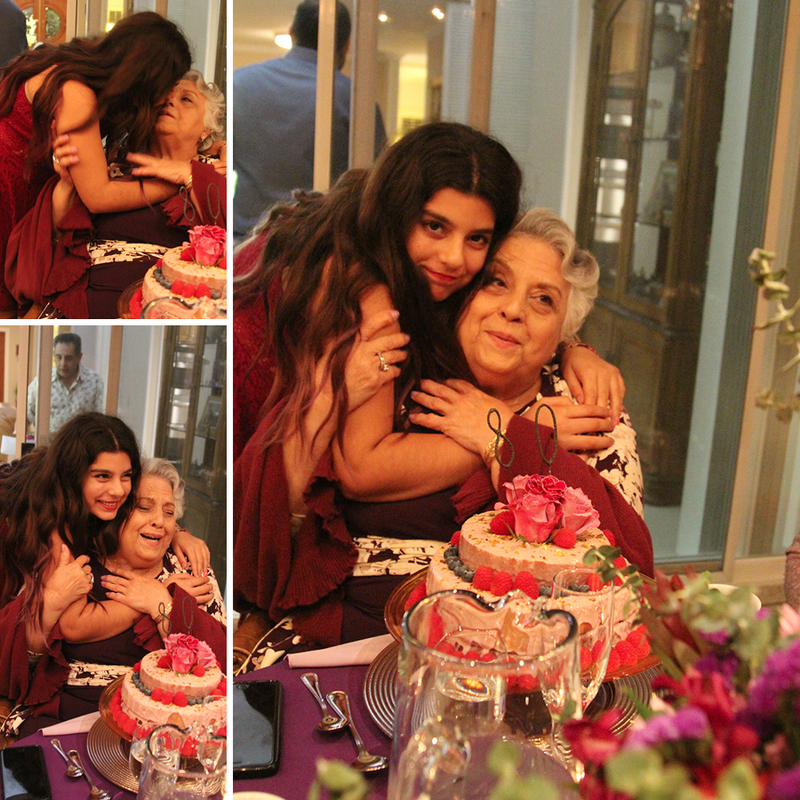 And that’s how you celebrate turning 80. Months ago Payam and his brother asked me if I’d help them plan their mother’s 80th birthday party. They know I love to throw a party but they might not have known how much I love to throw a party. If they had, they might have put on the breaks. In fact, in emails going back and forth between me and Payam’s brother, Ramin, he did just that. But of course I ignored his gentle warnings and went over the top anyway. Because that is what I do! 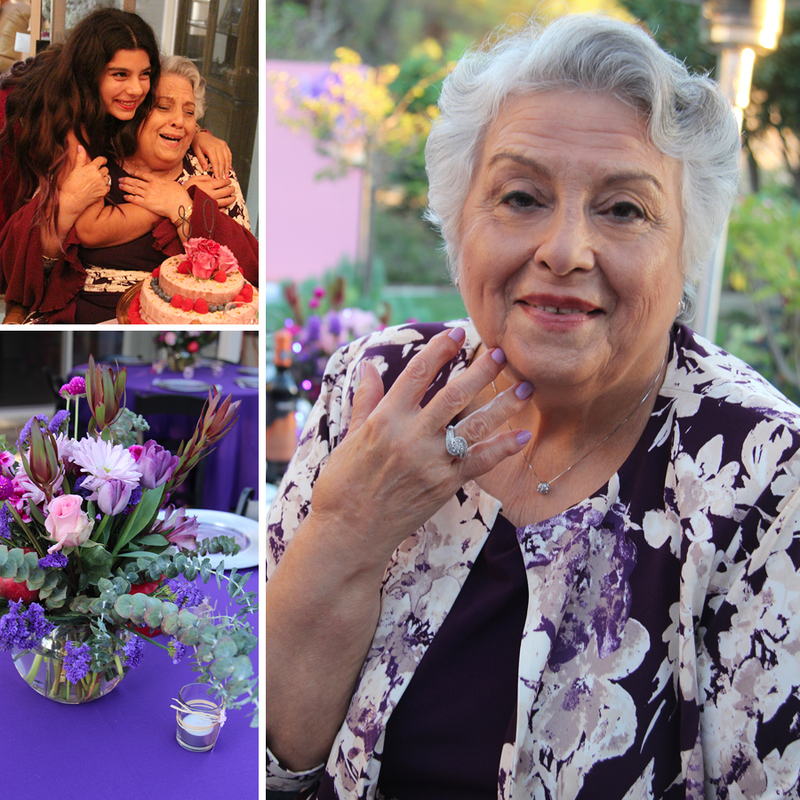 But guess what, everybody loved it and Payam’s mom was so happy! 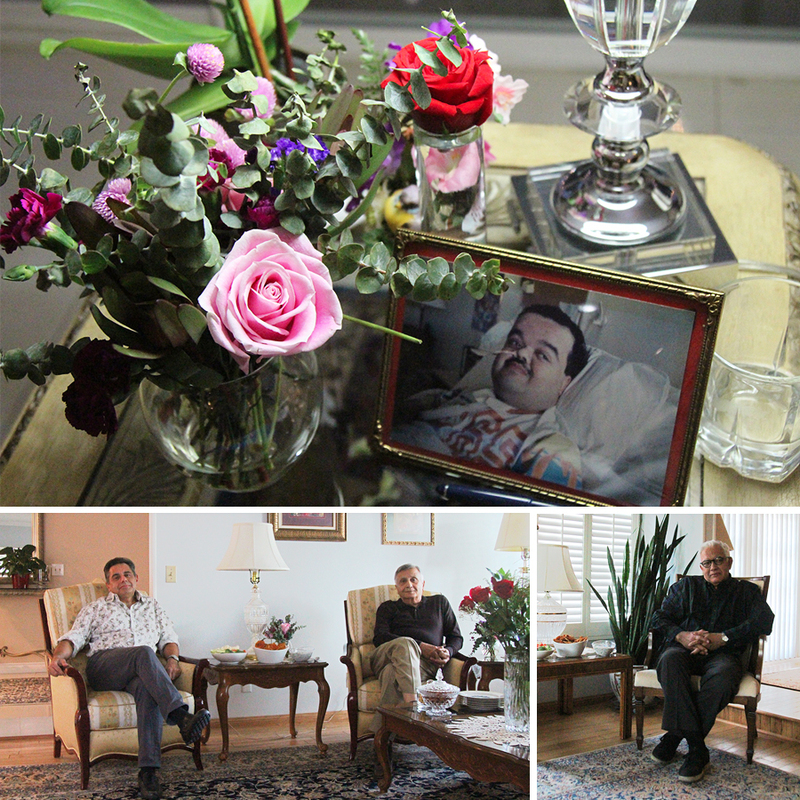 We visit Payam’s mom, Pedram, pretty much every Sunday. 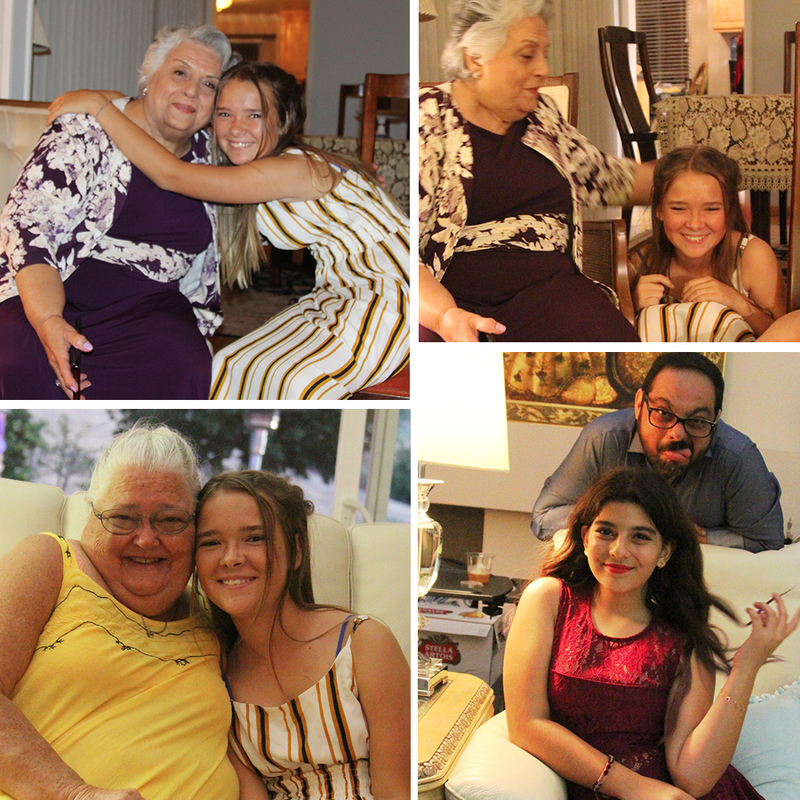 We have tea, we chat, we practice Farsi and sometimes I snuck in questions about what she might like for a party, because I need a theme when I plan a party. Maybe someday I’ll write a book about how to throw a good party. I kind of have some rough guidelines in my head that I fall back on. Not too complicated, right? Haha! It’s not complicated to me but I’m sure people who don’t throw crazy parties are probably rolling their eyes back in their head and scrolling to the next page. What can I say? I’m just not a solo cup kind of girl. To me it’s a work of art that I throw myself into and plan and plot for weeks on end. It’s so much fun and every detail makes me deliriously happy. Unfortunately, not everyone around me feels the same but I can’t help it because my brain is like a high speed train on a track that I can’t really do much about. It has to run it’s course or I get really really sad. 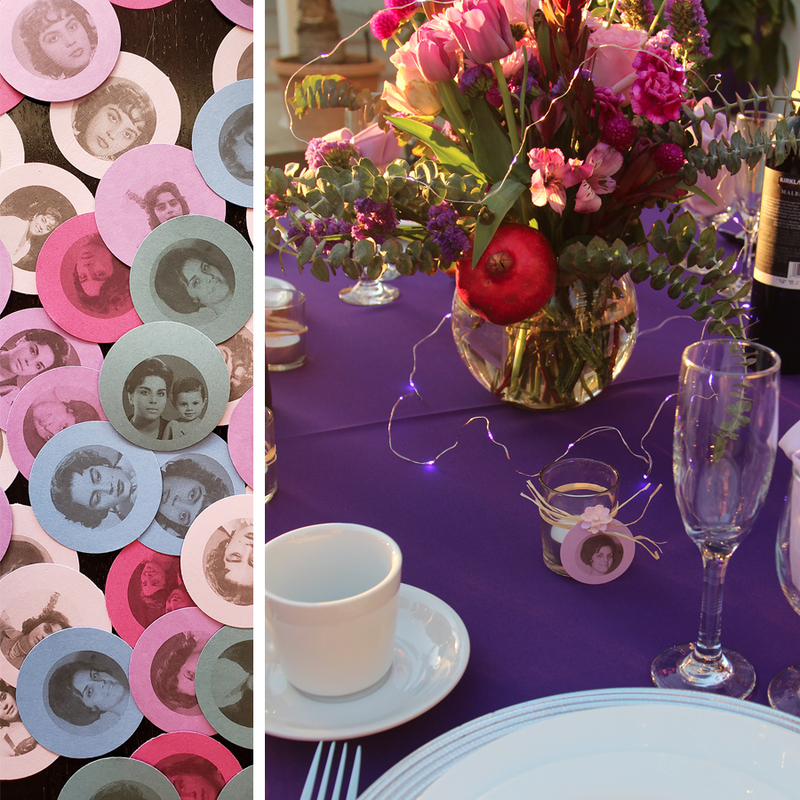 We decided on a purple theme with vintage photos for sparking happy memories. “Sentimentality in Lavender” is what I’d call it if I had to title it. 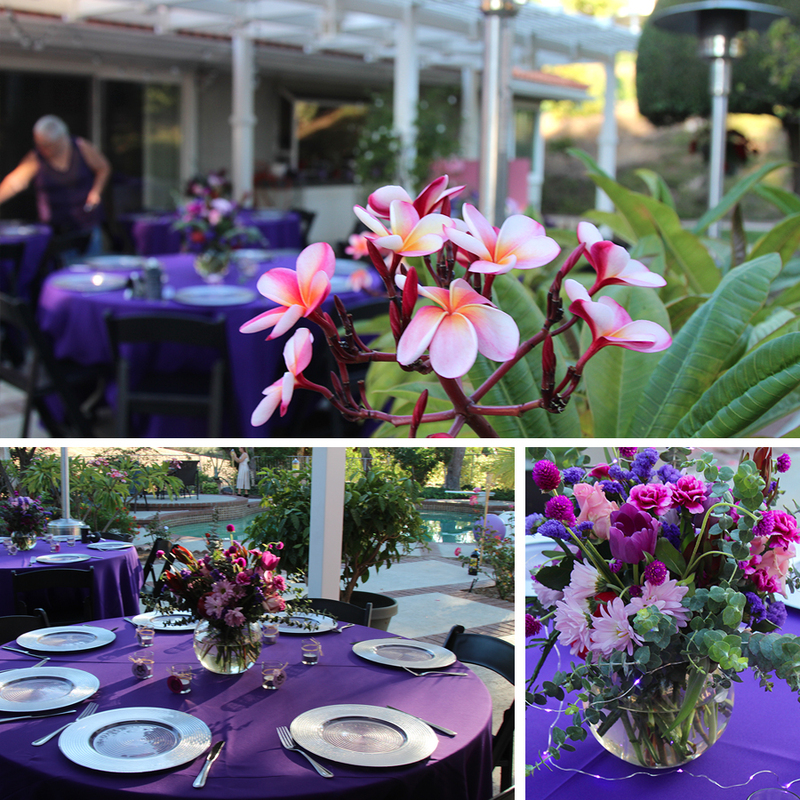 She didn’t really say what shade of purple she liked so I threw them all in together and since the party was at the beginning of fall and at night, I decided to go toward the richer darker tones with splashes of lavender. 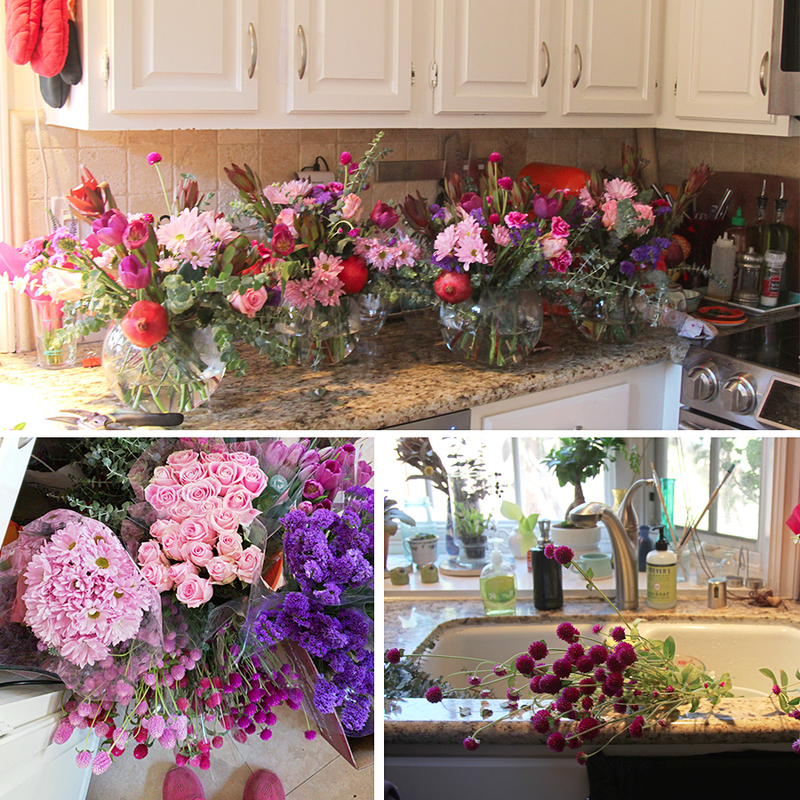 On the day before the party I stopped by a farmer’s market and bought every purple flower I could find. I also bought bunches and bunches of eucalyptus for greens because they hold up flowers nicely and fill out arrangements. For fun and a nod to Persian culture I sprung for some pomegranates because they love pomegranates. They also remind me of fall so there’s that. 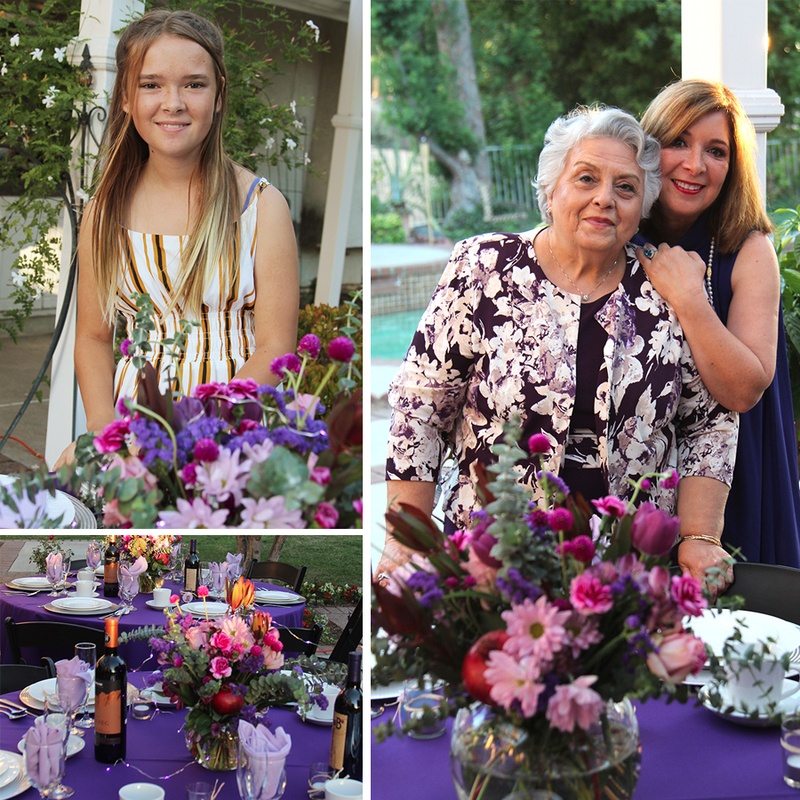 My mom (who was with me and who is often my partner in crime when it comes to these sorts of parties) wasn’t too sure about mixing reds and purples but I think it worked out really well and made the bouquets seem even richer. I love skewering fruit and sticking them in a bouquet! Joon made the cake. She was really super cute about it. 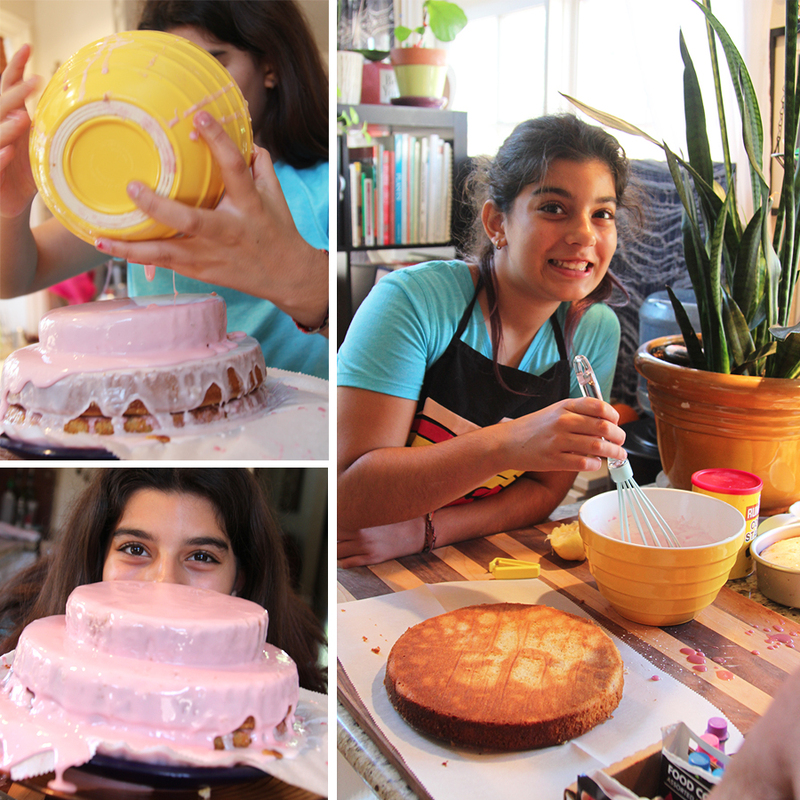 She’s on a huge baking kick lately (thank you, Netflix) and loves to bake any time we will let her. 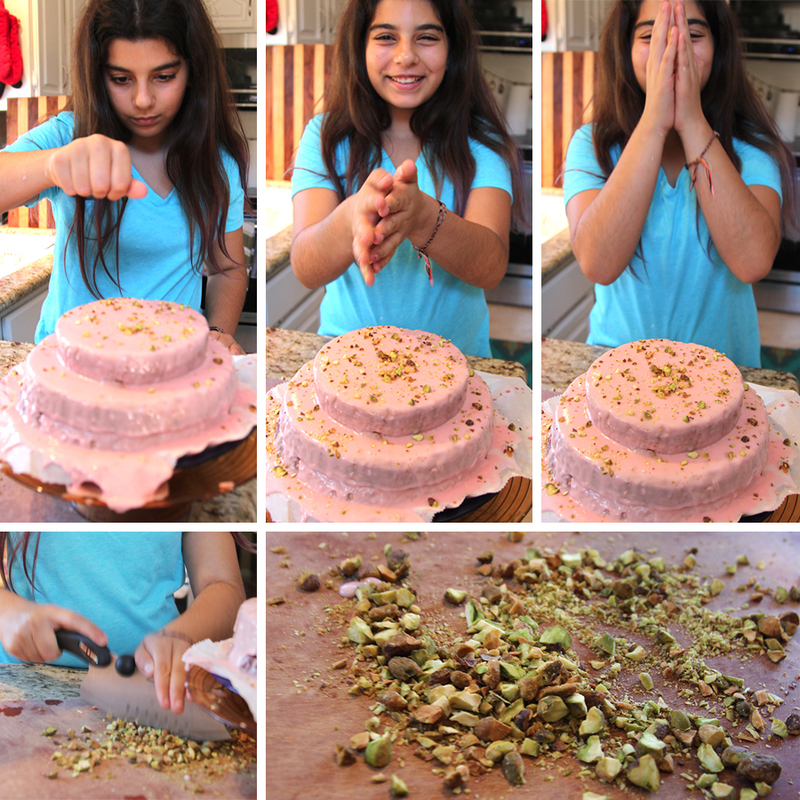 She was so excited to bake her grandma the perfect cake. 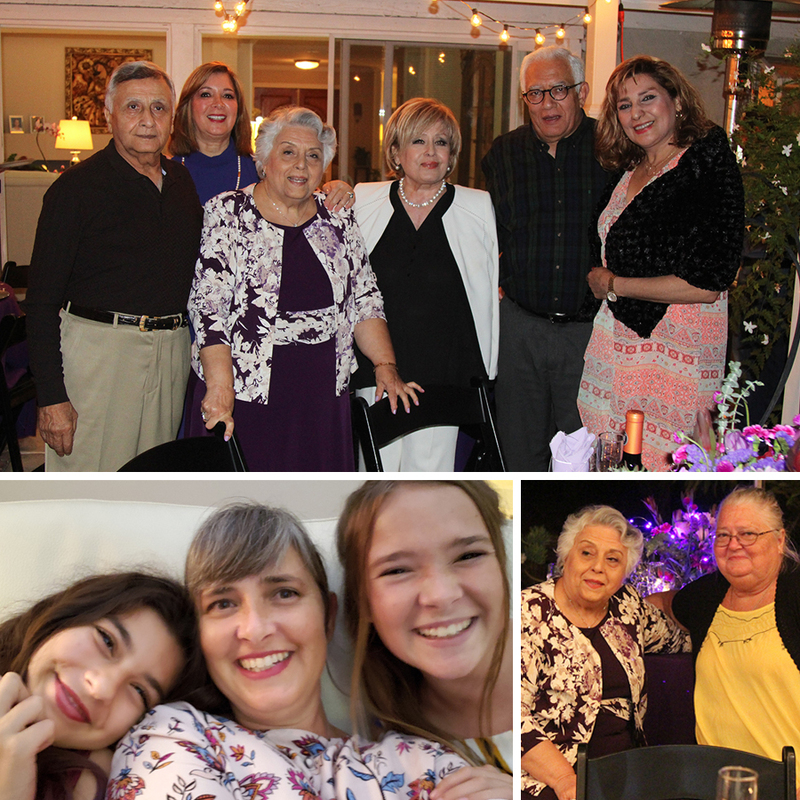 She even invited her grandma over one day (without telling us) and had her grandma sit in her room looking at cake recipes on her laptop. It was so funny. Payam was on a really important conference call (you know the kind where you have to sit at your computer with a button down shirt on even though you are wearing shorts beneath) and all of a sudden his mom and her care-taker come walking through our house to Joon’s room. Of course this was all fine but I thought it was pretty brilliant of Joon to be so proactive. 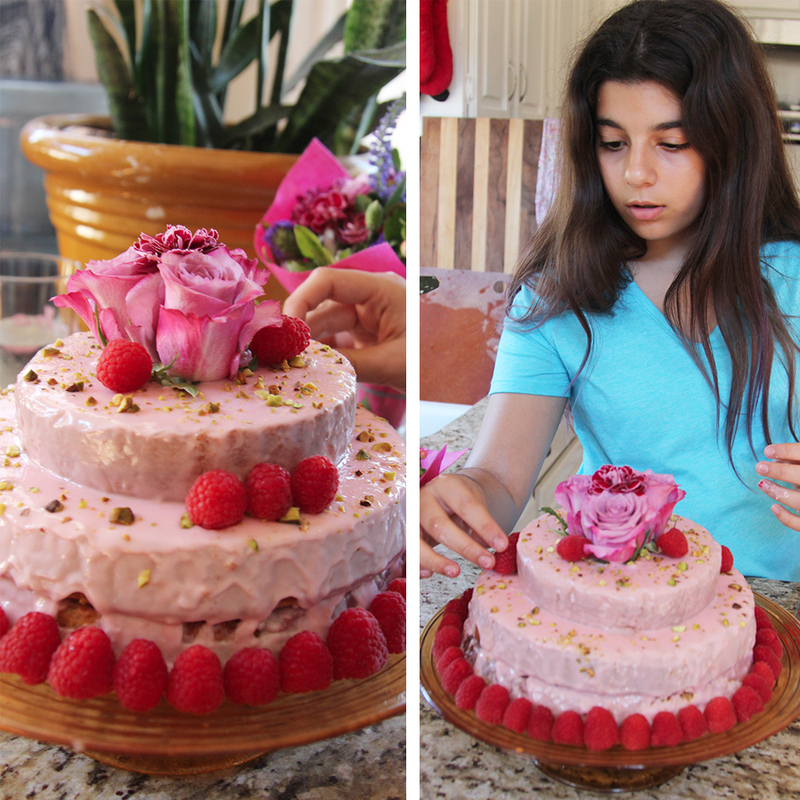 Joon and Pedram decided on a “Persian Love cake”. It’s basically an almond flour cake with rosewater flavoring and a lemon glaze. It was delicious! So good. But even better was her decorating. It was so pretty! She did such an amazing job. 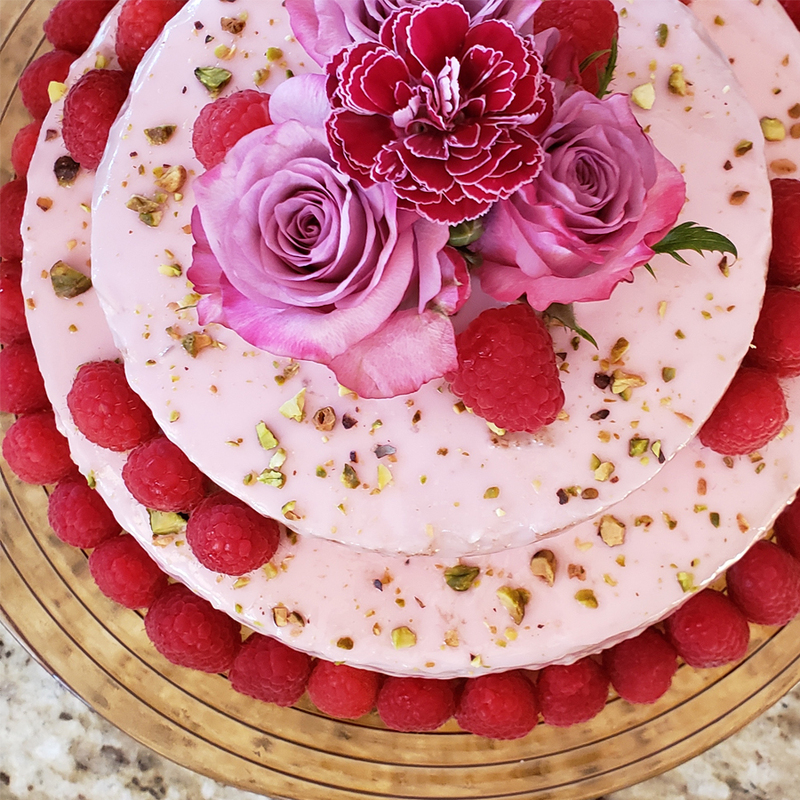 She glazed it with drippy layers of soft pink glaze and then decorated it with pistachios, roses and raspberries. Swoon! I mean look at this cake! Have you ever seen something more beautiful?!! This has spawned a whole new idea for Joon’s birthday in May. Maybe we could rent an industrial kitchen (if it isn’t too astronomically expensive) and have some sort of baking competition … It is just too much fun not to take advantage of. I love that she has found something she enjoys so much. After the cake was decorated and the flower arrangements were made, we drove to Payam’s mom’s house to start setting up. Payam’s mom has the most beautiful backyard. I’ve wanted to throw a party there since the first day I saw it. It’s perfectly set up for entertaining. And since it was so hot all summer it just seemed like the perfect time to throw a party outside in the evening when the air gets cool and it is so pleasant out. I love a good outdoor party under the stars. 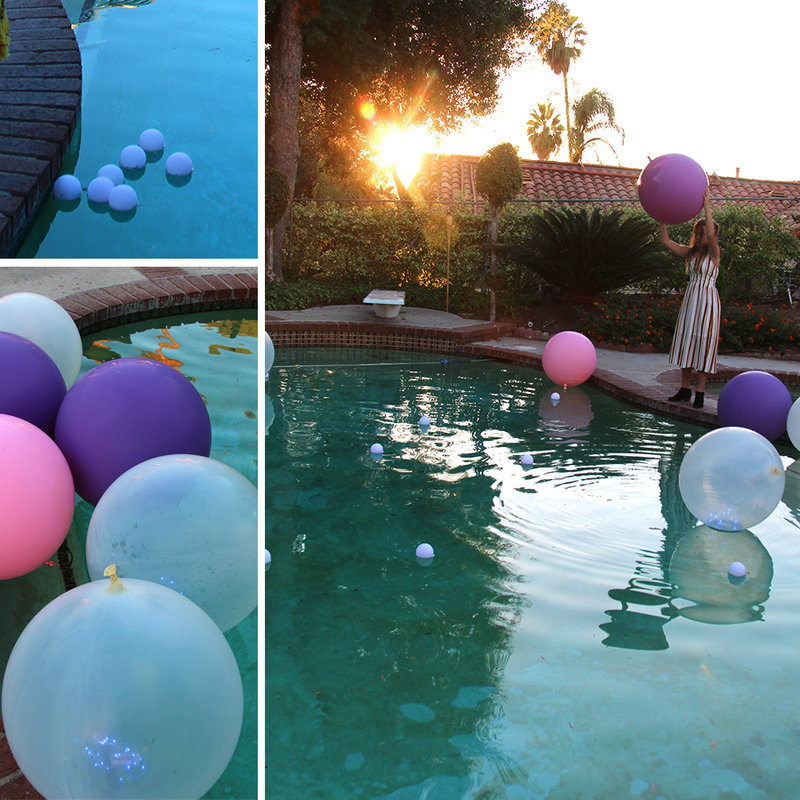 Since Payam’s mom has a big pool in the backyard I thought it would be really fun to decorate the pool with giant balloons and even better, giant balloons that light up as the sun goes down! The pool is so pretty in the twilight, kind of like a pond at the edge of a meadow. I opted to keep the pool lights off so the focus would be on the balloons and these cool little plastic floating balls I bought off amazon. 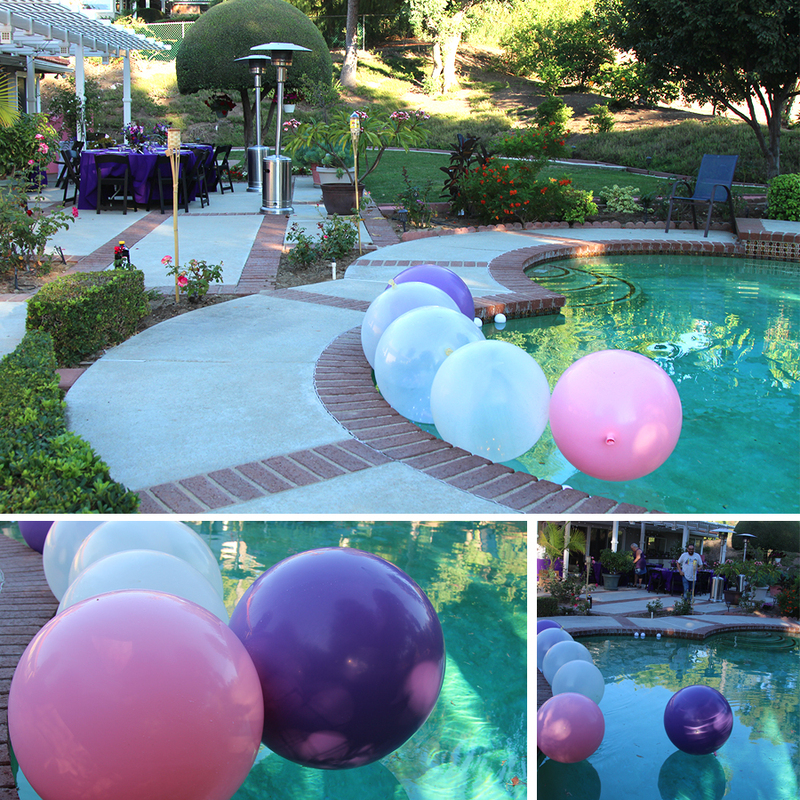 Adding mood lighting can be as simple as throwing some battery-operated fairy lights inside a balloon and then letting it float across the pool. I used the golden hour app to figure out what the prettiest time of the evening would be when I designed the invitation and sure enough it turned out perfect! Gotta love technology. Next up we created a slide show from old photo albums and put them in a play list that Payam could play off his laptop and project onto a big board. You might recognize the pink wall…It’s been downsized a bit. Payam built a stand for it and I added some new lavender and pink crepe paper flowers. 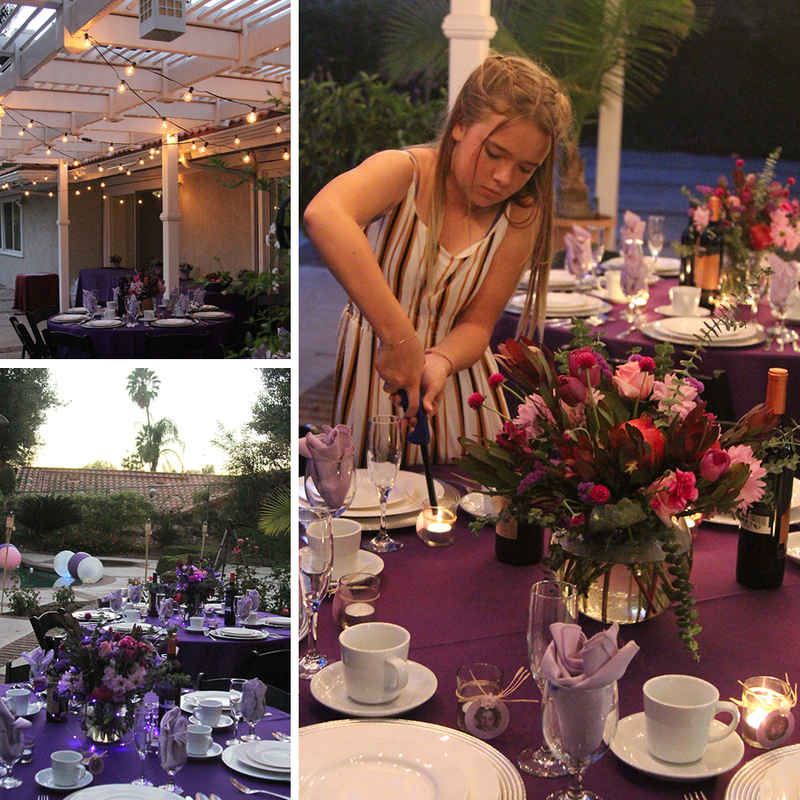 Then we set the tables (We rented tables and chairs and a couple of heaters). 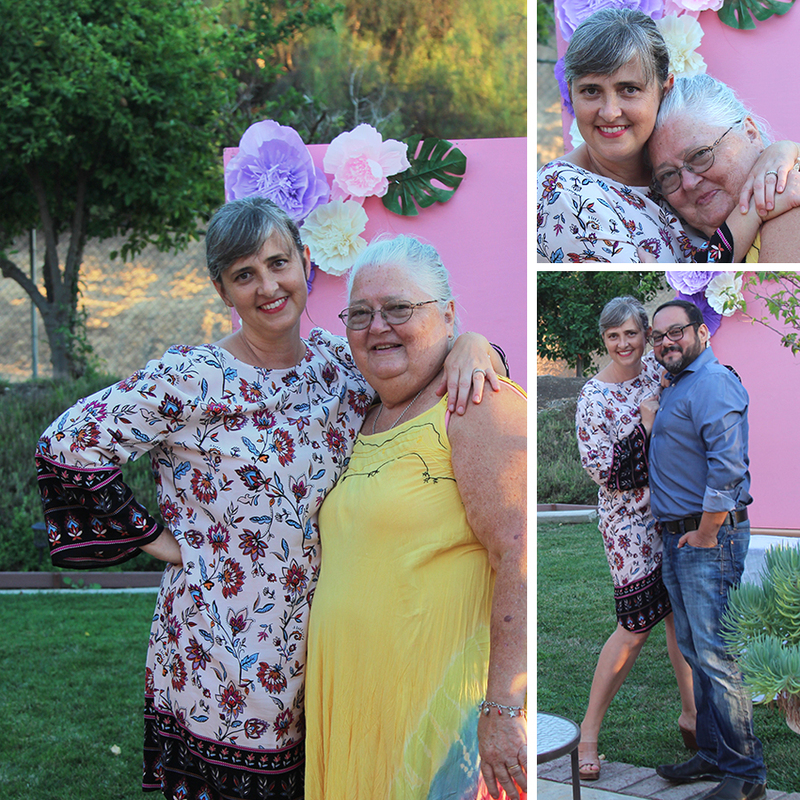 The birthday girl showed up in the prettiest purple dress ever! I love it when people join me in my theme ideas and get in the festive mood. Her dress was so perfect AND she painted her nails lavender (!). I just love her. The girls were very helpful with the balloons, making sure they stayed floating around the pool instead of only hanging out by the filter. 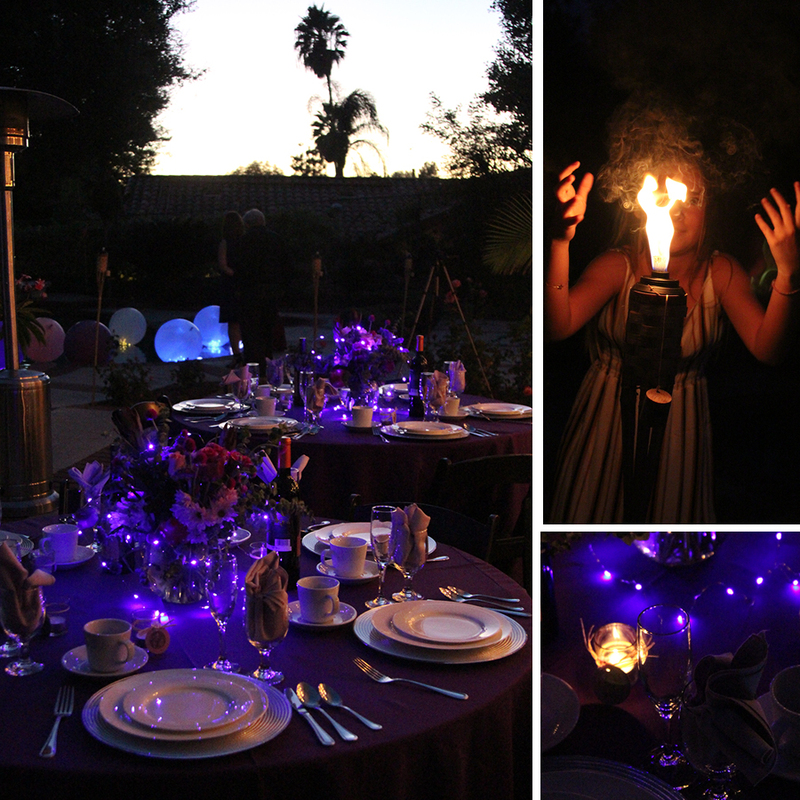 They also helped by lighting all the votives and bickering over who’s turn it was to use the lighter. Then everyone relaxed in the eye of the storm while we waited for the guests to arrive. I love a party that I am actually done setting up for before the guests arrive. I think this might be the first one. The sun went down and it just got prettier and prettier! Dinner went off without a hitch and then Joon brought out her cake with a sparkling “80” candle. Unfortunately, I was somewhere running around and didn’t get any photos of it actually sparkling but it was pretty impressive. 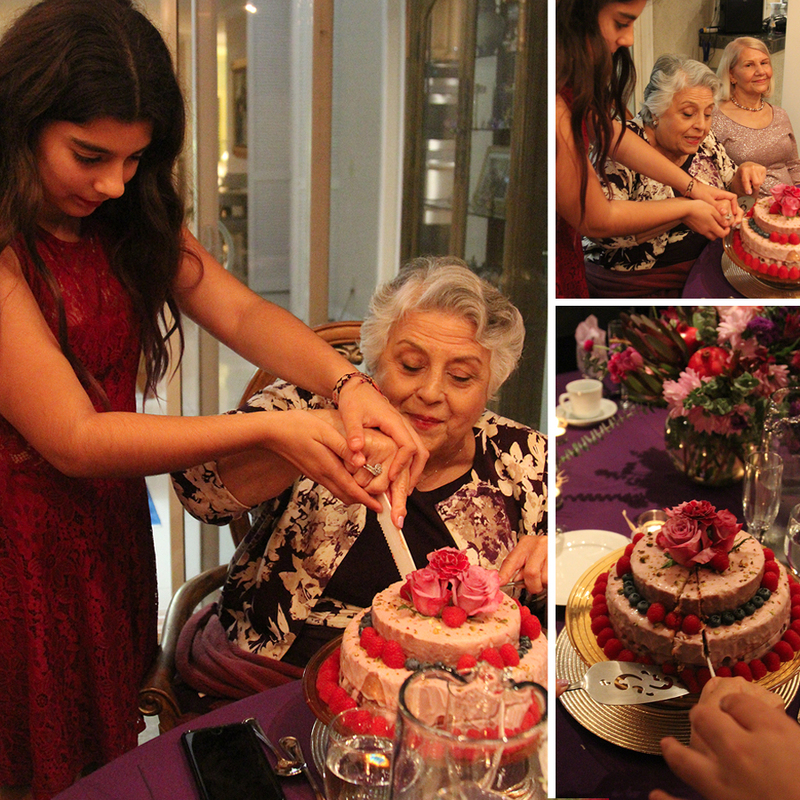 Then Joon and her Grandma cut the cake together and everyone lived happily ever after! Just kidding. The night was far from over. Everybody sat around and talked and laughed and got sentimental. We watched the slideshow and told stories. 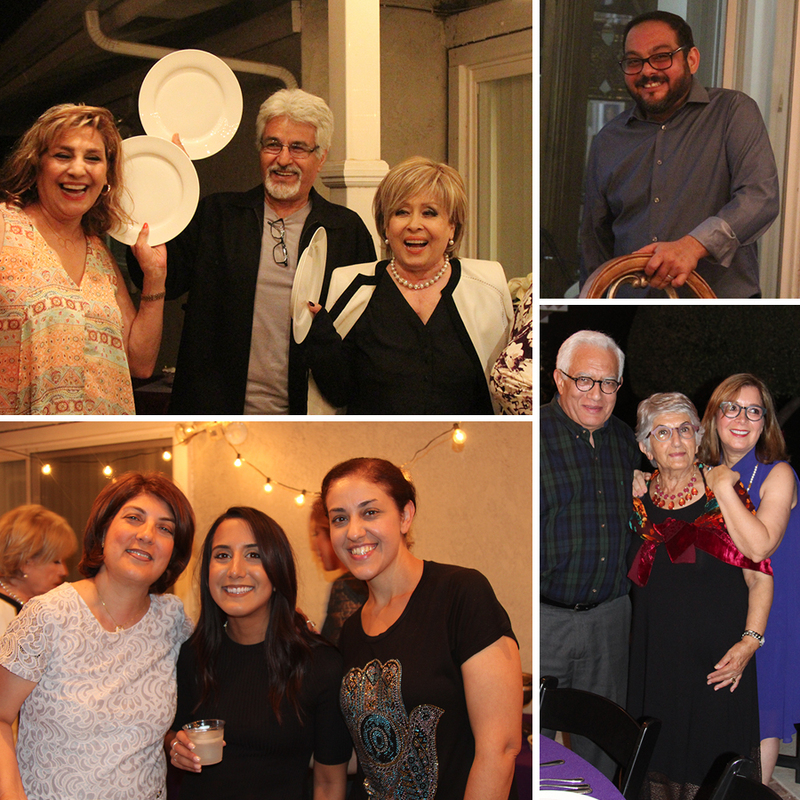 At one point one guest even launched into a serenade in Farsi that made all the first generation Persian Americans get a little teary-eyed and homesick for their homeland. (surprise, check!) 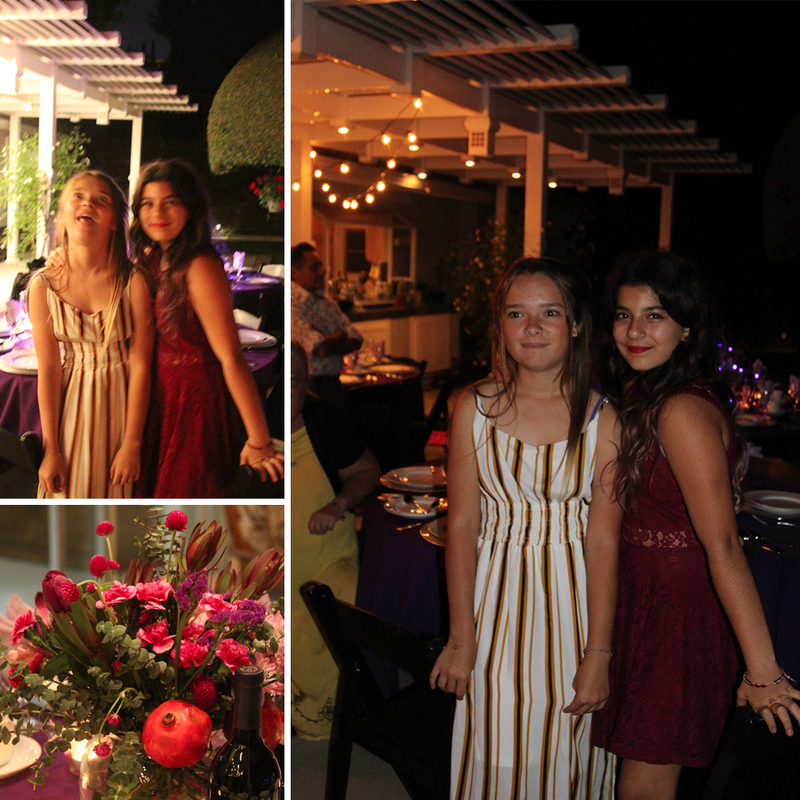 It was really an amazing night. So much fun. This is how I want to celebrate turning 80 someday. It really is something to celebrate and be proud of. 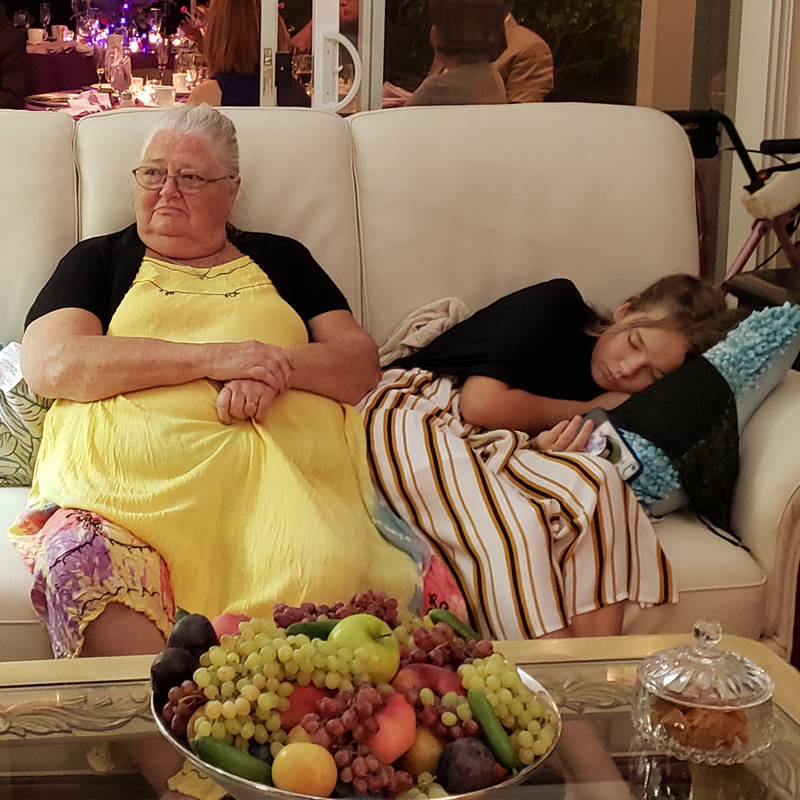 I’d love to say we partied until the sun came out but it was more like until the kids started falling asleep on the couch.